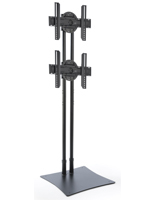 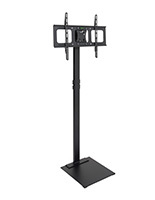 These monitor floor stands display flat panel TVs in a landscape orientation and come with mounting hardware. 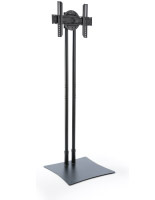 This type of rack is made of durable steel and hasa two-tone black and silver appearance. 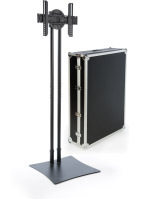 The floor stands support 26" to 52" TVs and are VESA compatible with sizes ranging from 100x100 to 800x400. 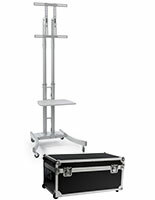 The flat panel holders measure 68" tall and have a slim design to fit in any room. 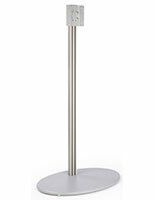 The stands in a landscape orientation are great for offices, schools and even living rooms. 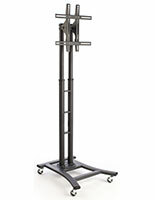 The steel racks are sent unassembled to save on shipping costs.